Jon Watts made waves at the 2015 Sundance Film Festival with his throwback thriller “Cop Car” getting enough attention that he was given a Golden Ticket to join Club MCU by directing 2017’s “Spider-Man: Homecoming.” Interestingly, Watts had another film in the can that had never been released, 2014’s “Clown,” produced by Eli Roth, and just this week is getting a small theatrical and VOD release. Why was “Clown” buried? Is it an example of a film that is only being seen because of its creator’s subsequent fame and should have been left in a shallow cinema grave? Or is it evidence of the talent that Watts would later show on a larger stage? The answer is somewhere in between. 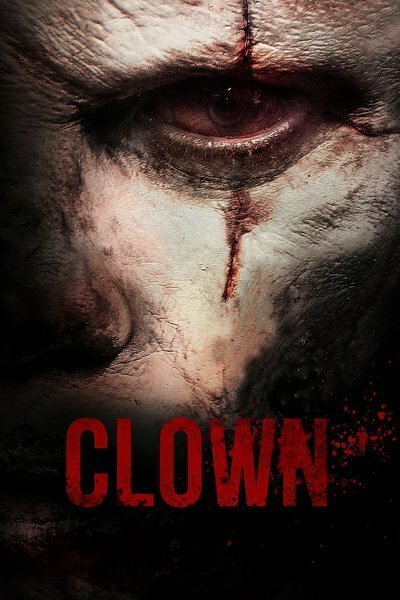 While “Clown” is far from the disastrous misfire that typically stains VOD horror movies (most range from awful to “I never want to see a movie again”), it comes apart about halfway through, losing a very difficult tonal balance. Having said that, there’s more to like here than the studio burial would have you believe. It’s actually most likely that the studio is semi-burying “Clown” (and didn't screen it for critics) because they’re a little scared of it. While it’s not as all-out gory as some of the films also produced by Eli Roth, it hinges on a no-no even in horror cinema—the violent, bloody, sometimes cannibalistic death of children. Horror fans will watch adults, especially morally corrupt ones, get drawn and quartered, but putting kids in jeopardy is generally considered a bridge too far. Seeing kids eaten by a killer clown? Kind of hard to put into a trailer. Long before he’s devouring rugrats, Kent (Andy Powers) is an average family man. When a clown doesn’t show up for his son’s birthday party, he finds an old suit in a house he’s trying to sell in his role as a realtor. The party goes off without a hitch but he falls asleep on the couch in his full clown gear. The next day, he notices that the red rubber nose won’t come off and the wig seems to have fused with his real hair. When he tries to get the suit off, even with a handsaw, he fails. As if spending the rest of your life looking like a vagabond Ronald McDonald isn’t bad enough, Kent notices that he has an new taste for the blood of children. A man (Peter Stormare, in full Stormare Mode) with a history with the clown suit tells Kent and his wife (an ineffective Laura Allen) that decapitation is the only answer before the demon in the suit takes over Kent completely. The problem with “Clown” is that it eventually tries to get serious and loses its way in two key places. First, there’s kind of a gross scene in which a bully gets his comeuppance in a most grotesque way that doesn’t work tonally (and when kid death doesn’t work tonally, it really doesn’t work). More long-term, the final act basically turns Kent into a child-eating demon, taking Powers out of the film as an actor and forcing Allen to do a lot of heavy emoting to try and save her husband. It’s around here that one starts adding up the film’s missed opportunities as well. It doesn’t really provide any truly frightening “scary clown” imagery to add to that crowded subgenre and it takes no opportunities to become something deeper in terms of commentary on fatherhood, masculinity, even childhood icons, etc. It’s really just a “killer clown movie.” One has to give Watts and Powers credit for really going for it and not pulling back from their disturbing concept, but that credit runs out before the movie is over. A Letter to the Writer/Director of "Son of Clowns"